Constructing a building consists of playing a Building card, and placing the associated wooden piece in a region of the gameboard. You must place the building card in the column of the same color, and then you can benefit from the power of all the cards placed in this column, starting at the bottom. The powers of buildings allow you to gain victory points, resources, or money, make scientific advancements, or attack your neighbors. It is also possible to construct a temple, which provides victory points at the end of the game. 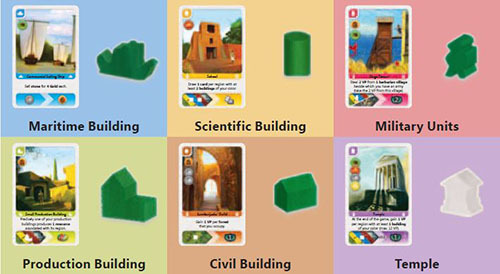 Each card in the game represents a building. There are 6 different types of building, easily identifiable by the color and the symbol associated with the card. Each type of building also corresponds to a wooden Building in the player color of its owner (except Temples). Note: For convenience, we will call all wooden pieces "buildings", including the ships and meeples. Orient the tiles any way you like. However, make sure that you never have 2 barbarian villages adjacent to one another. 2. On each barbarian village, place as many VP as the number of regions adjacent to it. As many Temple pieces as there are Continent tiles (4 with 2 players, 6 with 3 players, 7 with 4 players). 5 resources of each type (wheat, stone, clay, wood) per player (10 resources of each type with 2 players, 15 with 3 players, and 20 with 4 players). Note: Return any unused Temple pieces and Resource tokens to the box. During the game, players can no longer gain a resource that has run out. The VP and gold pieces, on the other hand, are unlimited. Players VP are hidden. 4. 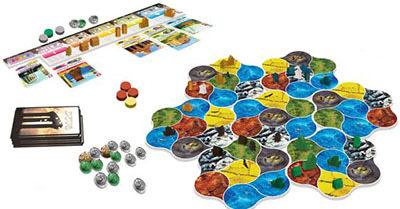 Each player takes 1 player board and the Building pieces in their color. Place 2 pieces of each type on the corresponding column of your player board. Set the rest of the pieces beside your player board to form a personal supply. 5. 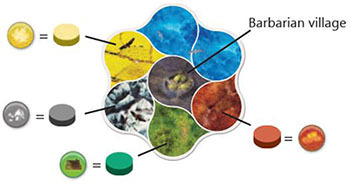 Each player takes 5 gold coins, 4 resources (1 stone, 1 clay, 1 wheat, 1 wood), and 5 VP. The resources come from the general supply. 6. Thoroughly shuffle the 96 Building cards and deal 5 to each player before forming a draw pile with the remaining cards. 7. Choose a first player and give them the First Player card. In order to construct building, you must first play a Building card from your hand. Note that there are two different types of building: standard and temples. Verify that you have at least one wooden piece of the same type on your player board. If you do not have a piece of this type, you cannot play this card. Place the card above your player board. Your player board establishes 6 columns by color. Place the card at the top of the column of the same color, such that the effects of all cards in that column are visible. Pay the construction cost indicated in the upper-left corner of the card. You can pay in resources and/or gold. Important: When paying the construction cost (and only in that case) each resource can be replaced by 4 Gold (even if the player has this resource). 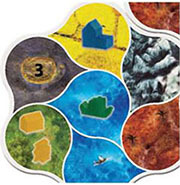 You must place your first Building in a region at the edge of the gameboard. The first regions occupied by each player must be separated by at least two empty regions, if possible. our subsequent Buildings can be constructed in either a region that you control, or an empty region adjacent to a region that you control. If you place a wooden Building in a region that you control, you must respect this fundamental rule: Each Building in a single region must be of a different type (for example, two civil buildings can never be placed in the same region). You cannot construct a building in a region occupied by a barbarian village (even if there are no longer any VP on this village). Maritime buildings (represented by ships) must be constructed in a sea region. The other buildings cannot be constructed in sea regions. If you wish, you may place a Building in an empty region at the edge of the gameboard in exchange for 3 VP. This can be useful in certain situations; for example, if you are blocked in. Benefit from the effects of all the cards in the column where you just placed the card. You must activate the cards from bottom to top. 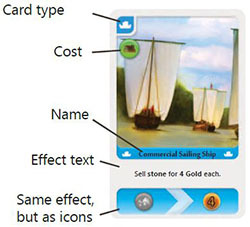 Each card's effect is depicted both with icons and with text. If you are building your first temple, place the card in the notch in the right end of your player board. In order to construct your 2nd temple, you must have 1 card of each color on your Player Board. In order to construct your 3rd temple, you must have 2 cards of each color on your Player board , and so on. Pay the construction cost indicated in the upper-left corner of the card, which is always 1 resource of each type. Because it is a construction cost, each resource could be replaced by 4 Gold. 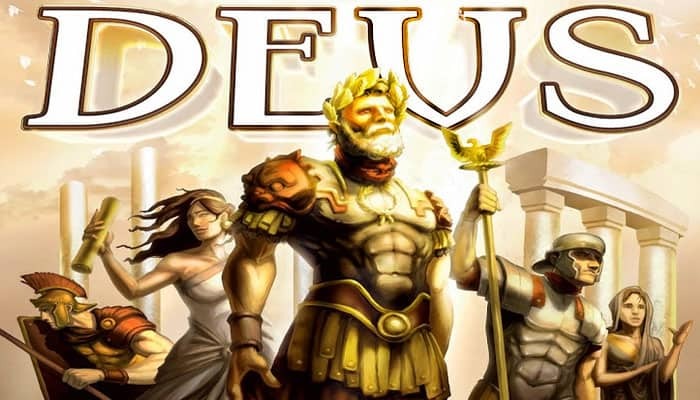 The constructed temple provides VP (12 VP maximum per temple) at the end of the game, according to its effect. Place a wooden temple from the general supply in one of your regions (not in an empty region). As with the other types of building, you cannot have more than one temple in a city. The temple is recognized as a standard building for card effects that depend on the number of buildings in a region. 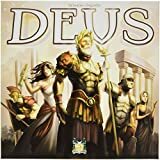 Note: If you build your temple in a region comprising only a military building (an army), you will not be able to move the army until you build another building in that city. You are not allowed to abandon a temple. Important: Unlike the other buildings, it is still possible to play a Temple card if the temple supply is empty. In this case, you simply do not place a wooden temple on the gameboard. Anna built her first temple. She places the card in the notch in the right end of her player board. Anna built her second temple, which she was able to do because she has 1 card of each color (1 in each column) of her Player Board. 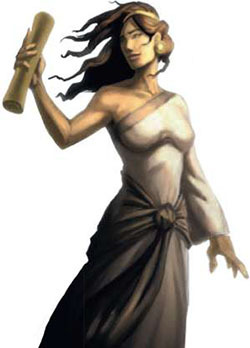 She places the card in the second position of the Temple column. Players occupy all the regions adjacent to the village. There is at least one army in those adjacent regions. 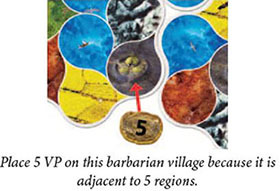 When this happens, the village is attacked by the player who has the most armies in regions adjacent to the barbarian village. The attacker simply wins the VP placed on the barbarian village. From now on, the region is no longer considered to be a barbarian village for card effects that depend on this. In the case of a tie, the tied player who has constructed more buildings in those regions wins the VP. If it is still a tie, the tied players share the VP, rounding down. Madeline just placed a maritime building in the sea adjacent to the barbarian village. An attack occurs immediately because the two conditions are met. Anna wins the 3 VP placed on the Barbarian Village because she has the most military units around the barbarian village. Important: If at the end of your action, you no longer have cards in your hand, you automatically draw 5 new ones. Whenever the Building card deck is empty, shuffle the discards to create a new deck. Discard as many of the cards from your hand as you wish, and announce how many you are discarding (you can keep some of your cards, as long as you discard at least 1 card). Place the cards face-up in the discard (the other players will know only what the topmost card is, not the others).
. Benefit from the power of the god associated with the topmost card on the discard. The god's powers are depicted on your player board. The magnitude of the power is proportional to the number of cards that you discard. The gods also allow you to take wooden pieces from the general supply and place them on your player board. Draw cards from the deck in order to replenish your hand to 5 cards. If you invoked Minerva (yellow/scientific), draw one more card per card you discarded in Step 3 above. Important: It is never possible to have more than 10 cards in your hand. If you have the ability to draw beyond the 10th card, you must stop drawing when you have 10 cards in your hand. Note : If you have more than 5 cards before starting this step you do not need to discard down to a hand of 5 cards, you will simply have more than 5 cards in your hand. Gain 2 gold per discarded card. Also gain 1 wooden maritime building. Gain 1 resource of your choice per discarded card (You may choose resources that you do not produce). Also gain 1 wooden production building. Gain 1 wooden scientific building. You can draw 1 additional card in Step 4 (see below) per discarded card. Gain 1 VP if you have discarded 1 card; 2 VP (total) if you have discarded more than 1. Also gain 1 wooden civil building. Gain 1 wooden building of your choice per discarded card. You do not have to take a military building. Use the power of one of the 5 other gods. Jupiter acts as a "wild". You can only invoke one god per offering. All the temples from the general supply have been constructed. All the barbarian villages have been attacked. When one of these conditions is met, finish the current round, so that all players get a equal number of turns. Then play a final round, during which each player can choose one final action. VP won during the game. Points awarded by their constructed temples (12 VP maximum per temple). For each type of resource (wheat, wood, stone, clay) and gold, check to see which player has the most (it must be at least 1). That player receives 2 VP. If there's a tie, each tied player gets the 2 VP.